Last Friday saw the debut performance of Roundelay by the Fourfront Poets. This was a dramatic reading of the poetry of Samuel Beckett, specially for his centenary. It was staged at Impact Theatre as part of the Cuisle International Poetry Festival. 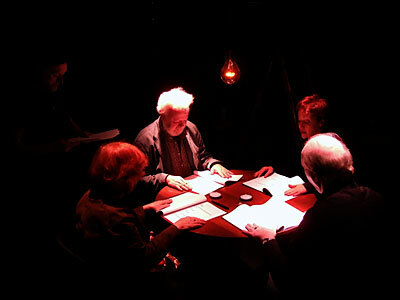 Mark Whelan directed the four readers: Ciaran O'Driscoll, Bertha McCullagh, Mairtin O'Briain and Jo Slade. A very particular atmosphere was set up by way of the staging and other elements. Tom O'Donnell provided the lights and I created a sound design, using the custom software mixer I recently released into the world. The performance had a great audience and was a huge success. The resemblance to a seance was noted by many people, some of whom believed there was a strong Beckett presence summoned into the room. The whole of the Cuisle festival was a lot of fun. I got to meet poets I've seen in previous years, the crew from Brighton I met a year ago, and new faces as well. The photo above was taken by Susannah Kelly and will likely be the basis for a poster design for the next performance.